Bob Quick, Britain’s most senior counterterrorism officer, was forced to stand down today after an embarrassing security leak resulted in a major anti-terror operation, designed to foil an alleged al-Qaida plot to bomb Britain, being rushed forward. ….Police were forced to carry out raids on addresses in the north-west of England in broad daylight yesterday, earlier than planned, after Quick, the Metropolitan police’s assistant commissioner, was photographed carrying sensitive documents as he arrived for a meeting in Downing Street. 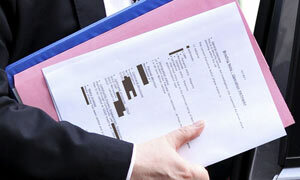 A white document marked “secret”, which carried details of the operation being planned by MI5 and several police forces, was clearly visible to press photographers equipped with telephoto lenses. The Guardian helpfully reproduces an enlarged, rotated, redacted version of the document here.